Going for Growth – Transforming organic food and farming in the UK. 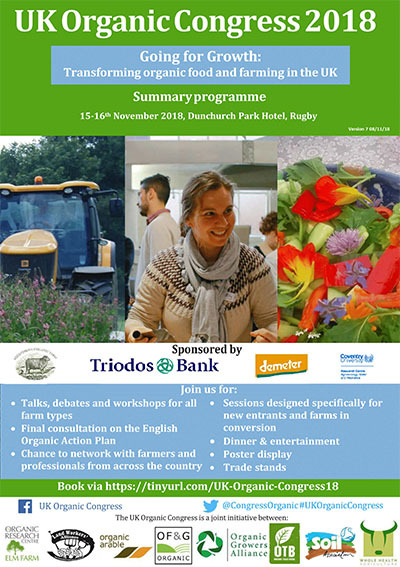 The UK Organic Congress 2018 is a unique event organised jointly by leading organic organisations, including the Organic Research Centre, Landworkers' Alliance, Organic Arable, Organic Farmers & Growers, Organic Growers Alliance, Organic Trade Board, Soil Association and Whole Health Agriculture. The UK organic food market is growing fast, at 6-7% annually, as part of a global movement for change in what we eat and how it’s produced. But we trail our European neighbours, many achieving over 20% growth and food market shares of 10%. Big opportunities exist for producers to convert to organic production, supported by a food industry responsive to consumer demand, delivering environmental as well as economic gains. Reaffirming the potential of organic food and farming in the UK needs fresh approaches to ensure core organic principles and the expectations of citizens can be delivered. Enhancing the environmental and other public benefits of organic production while ensuring fair incomes for farmers and affordable prices for consumers is critical. As we contemplate leaving the EU, what transformations should we be seeking to make the UK an organic world leader again? Underpinning organic food and farming are some big ideas about how to make a better world. The organic approach cares about things that affect us all – health, welfare, the environment, fairness, quality and sustainability. Communicating this needs a focus on real benefits, while building bridges with others. The Congress will feature a new, positive vision for the contribution that organic can make to UK food and farming, including an aspiration to be up there with the best in terms of production and market shares. The organic sector is well placed to take a lead in the future development of UK food and farming. Organic food standards, the dynamic organic market, Food for Life, the OTB Promotion Campaigns, Innovative Farmers and the Agricology on-line information hub have shown what can be achieved collectively. The Congress will highlight the new industry-led organic action plan in England and similar initiatives in other parts of the UK in making real change happen. The Congress is not only for those already engaged – if you are exploring organic as an option for your future business, then this event is also for you - all are welcome! Dunchurch Park Hotel (Rugby Road, Dunchurch, Rugby CV22 6QW) is located in the heart of Warwickshire, with modern conference facilities, set in 72 acres of gardens and grounds. It is just outside Rugby, with free parking and good train connections to London, Birmingham and beyond. If sold out the venue will arrange rooms in the neighbouring Draycote Hotel at £75 per room including breakfast. Accommodation in these and other hotels can also be found on Booking.com and similar websites. Early booking is strongly recommended. Members of Progressive Farming Trust Ltd. Patrons of Progressive Farming Trust Ltd.
Members of other partner organisations will need to refer to their own organisation webpages for information.